The magpie is a resident bird which belongs to the Corvidae family. The sharply contrasting black and white plumage reveals a green and purple floss on closer inspection. In a strong wind, its remarkably long black tail is iridescent with green and bronze while the white feathers at the base of each wing give the magpie a striking appearance in flight. Although the magpie may be encountered in all parts of the island which are lightly wooded, it shuns the larger towns, preferring the vicinity of the villages. Nests are placed in carob-trees and other low glowing trees and are made of sticks, Iined with earth and usually covered with a dome. The normal clutch is five egg but it also acts as host to the great spotted cuckoo's eggs. 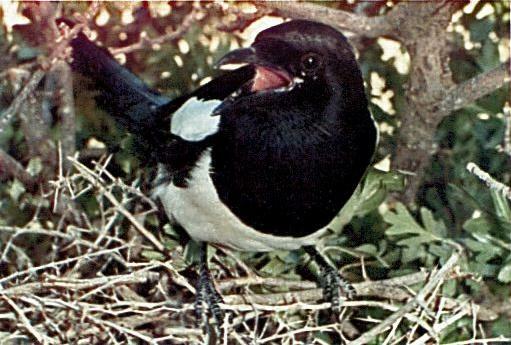 Young magpies can be easily tamed and trained to imitate sounds or utter words just like parrots. In the hot season, magpies bully the donkeys grazing in the fields; alighted on their backs they keep pecking their cuts, wounds or corns continually pestering them. They spend much time feeding on the ground or hopping around. In the Cypriot folklore there is a story, similar to one of Aesop's fables, referring to the magpies (katsikorwva or katsikoutala in the Cypriot dialect) gawky steps. There was a magpie who saw that the pigeons in the yard of a house at the end of the village were well fed and well looked after by their owner, while she was pecking donkeys' wounds all day long. So the thought of changing her colour to look like a pigeon in order to eat well with them. She went into a tub full of plaster and became snow white and mingled with the pigeons. She had a good time for two or three days until the plaster peeled off and the pigeons realized who she was. They kicked her and threw her off the wall and she broke her legs and could not walk straight. Ever since, she has been limping and has become the laughing stock of people and birds. The magpie was a pedlar and had a measuring bar with which she was measuring fabric; this bar was too short and they found her out and stuck the bar through her back; this is why she now has such a long tail. piavw tov rotsov pou xamai tz' ai lyw tnv tzefalnv sou"
(Adorned magpie sit still for God's sake or else I'll get a stone from the ground and crush your head). (Adorlled magpie holding a purse in its beak full of coriander seeds). (This refer to honest people whose reputation is not stained by slanders; it literally says: the fact that a magpie has eaten dung does not mean that the sea is soiled).